Skunks. They are mostly black with white stripes. They are active at night. There are a few different species in our area, but they all have one thing in common. They can stink! 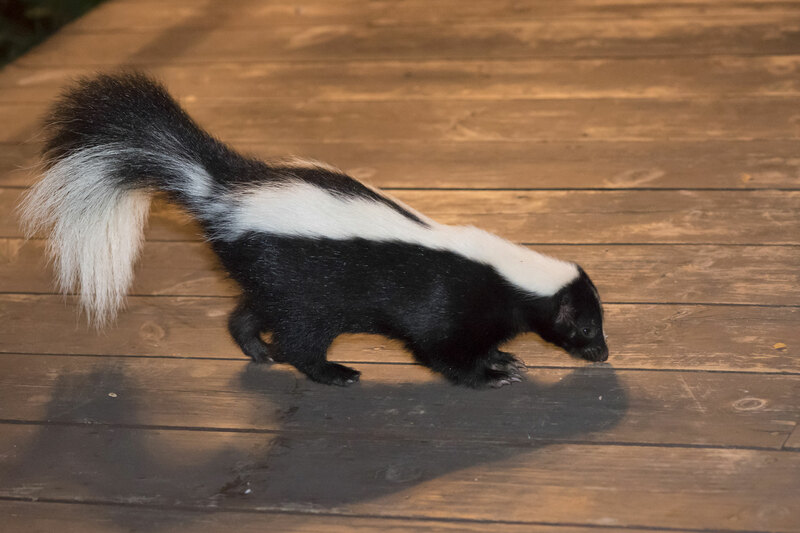 Skunks are mostly black, with some white stripes, active at night and weigh about 10 pounds. If they get into your house you will know about it quickly, but it is more common for skunks to damage lawns by digging under the grass looking for grubs. There are no poisons or pesticides labeled for control of skunks. Trapping or exclusion are the methods of control that are available. The key to solving your wildlife issue is to determine what is getting in and how they are getting into your structure. We will inspect the property to determine where the access areas are. We can take pictures of the areas and show you exactly what is going on. Once we know what we are dealing with we can provide several options to deal with the problem. Exclusion: We want to exclude the pest from getting into the house. If there are multiple holes we will close all of them except one. Then, we install a “one-way door or funnel”. This device allows the animal to get out but not back in again. After waiting a few days the device is removed and the final hole closed. It should be noted that this method leaves the animal(s) alive and in familiar territory so it has the best chance of finding another home. Trapping: We can leave a trap or traps set for the animal(s) and once we have caught it(them) we can close up the access hole.